I was off looking at handcrafted items and he walked up with the largest plastic cup I’d ever seen and I assumed it was a Coke. No, ladies and gentlemen, it was a piña colada. I laughed out loud knowing I could never ever drink that much. After the first sip through the straw, it felt like I was drinking candy and after about 15 sips I realized there was a fair bit of rum in that cup. I drank the whole thing and he bought me another one. I’ve never forgotten how much I giggled that day. I have no recollection of being seasick but I did have a bit of a headache the next day at sea and it was all John’s fault. I’m not a big drinker and when I do drink it’s usually scotch and a little water over ice and one drink can last the whole night. Plain and simple – like me, really. Recently I was asked by Crazy Sales if I’d like to collaborate with them to review one of their small appliances for Orgasmic Chef. Like most of my readers, I’ve got nearly one of everything because I can’t resist new toys but I didn’t have an ice maker. I have an ice maker in my freezer but the refrigerator is too big for the space so we built that in with a coffee machine and combi-oven. We have no water to the fridge where it sits now so no ice other than dribbling trays of water from the sink to the freezer. The Maxkon 3.2L Portable Ice Maker I asked for arrived the other day and after the required amount of time to let it sit and get used to its new home, I filled it up with water and waited. This is a well made, sturdy machine. 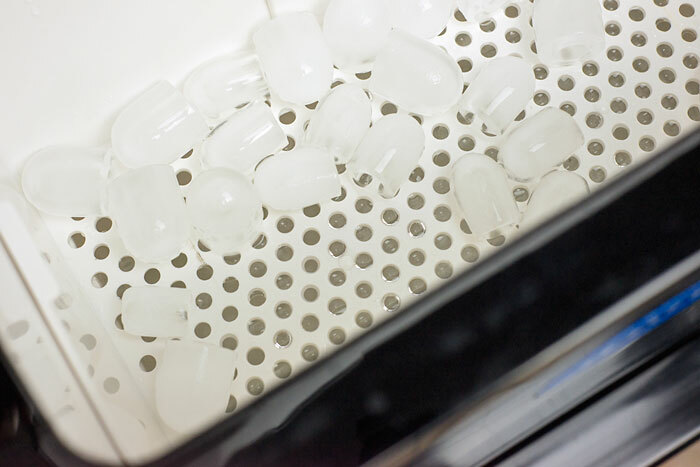 If you’re in Australia, read all the way to the bottom because one lucky person can win one of these ice makers. If you don’t want to wait, you can buy one of these babies for only $270. I figured it would take a few hours to get ice so when I heard a little crash in the kitchen, I yelled at the dog thinking he was in the pantry trying to get treats. Again. It wasn’t the dog — it was new ice. It only takes 10 minutes to get the first cubes in the bin. After tossing out the first couple ice cubes or bullets, it was time to make something. That’s when I remembered that first visit to George Town and those gigantic piña coladas. Recently my daughter-in-law in Atlanta sent me some cream of coconut (Coco Lopez) as a gift and I’d put it away like you’d put away a treasure, only I couldn’t find it. After about an hour of looking (and it’s always in the last place you look) there it was in the back of the pantry where I’m sure I’d looked at least 50 times. My ice was ready (the ice maker makes up to 20 kilograms/44 pounds of ice every day), I had the cream of coconut and some pineapple juice, a fresh pineapple and some maraschino cherries. Don’t abuse me for having the cherries because I bought them for something and then never made whatever it was I had in mind. All the ingredients, including the ice went into the blender along with some rum and the aroma instantly transported me back to the Caribbean but first I had to take some photos. When I was done, I emptied both of these glasses. Then I drank what was left in the blender. “Whut? ?” I said in my best American voice. “Nothing… you look odd,” and walked out the door. No judgement. If you’re like me and you like ice but don’t have an ice maker in your refrigerator and don’t like fiddling with tray after tray of water to the freezer, check out one of these portable ice makers. I wish I’d thought about this 3 years ago. On the other hand, if you are craving a piña colada now, here’s how I made these. If you use a straw, it doesn’t feel like alcohol at all. This drink tastes just like the ones you get in the big cups in the Caribbean. Place everything in a blender and whiz until there are no pieces of ice and the mixture is partially frozen. Pour into glasses and garnish with a cherry and a wedge of fresh pineapple.